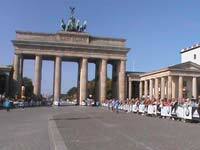 Berlin is one of the 6 Marathon Majors and is a world record course. This speaks for itself - it is a fantastic event and one that sells out in record time too! 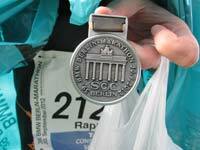 Every runner wants to run Berlin and now you can - We have GUARANTEED entries. As well as having one of the best races in the world it is also a wonderful city to explore. We feel we have just the right deal for you. This is the fastest Marathon course in the world. It takes in many of the sights of this great city. What better way of seeing them than to run round them! We know how important it is to have a conveniently located hotel. 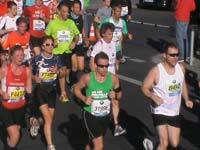 Our quality hotel is just perfect for the Berlin Marathon and is just 800 metres from the race start. We even have a short cut to the start area which means you don't have to leave your own room until just 30 minutes before the start (if you don't want to). You will still make it in plenty of time (great for that last toilet visit!). You don't want to share a portable toilet with 39,999 others or worse still, as we saw this year, make a dart for the bushes to spend a penny after just 2 minutes running! The last 4 years have seen perfect weather conditions for running – cool but sunny. 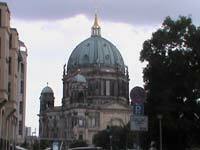 Berlin is a vibrant capital city. It is known for it's liberalism and the people are genuinely friendly with almost all speaking a good level of English. Most menus etc are printed in English and of course we have a great carbo-loading meal planned for the night before the race, and a celebration party to rival all after it. It should not be forgotten that this is the start of Octoberfest (yes in September!) and we know a couple of great venues where you really can Ooompah with the best of them! We will provide you with a Berlin city map, a list of ideas of things to see and do including tips we have learnt from our time here. There are stacks of museums and galleries and all sorts of tours (Bus, Boat, Walk) taking in some of the stories and history of this place. 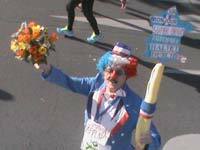 The 'Running Crazy' representative will be on hand most evenings too, to help you get the most from your time away. This weekend offers a great opportunity for Clubs, or training partners to get together. Some Clubs already make this event their annual outing, and it is ideally suited. Travelling together may also be more convenient. There are discounts available for large groups (20+), but even a group of just 10, will qualify for an additional prize for the first or last to finish. Thanks very much to you and your team for a great weekend. We really enjoyed our time in Berlin and despite the injuries leading up to the race, I finished it, without further problems to calves or achilles so it's onwards and upwards from here! 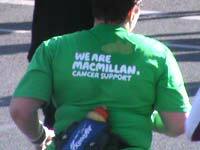 Plus the charity I run for is £4500 to the good so I count that as mission accomplished! Just watched the DVD which was fun; what a nice idea! Anyway, I wanted to say a sincere thank you for all your wonderful organisation which certainly helped to make the whole weekend so relaxed and enjoyable. See you in Benidorm in ......7 weeks! Thank you again for another great weekend organised by Running Crazy. Hi Malcolm just wanted to send a big thanks for all your organising etc. I had a great time. I was also over the moon to achieve a big goal of mine with a sub three and Michael with his first marathon!! I will recommend you to my club and i will definitely use you again. 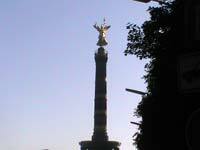 I would love to do Berlin again next year. It definitely does what it says on the tin, the race was hassle free and with everything being arranged for us removed any worries we may have had. Ready for the next one now ! Thank you so much for great organisation in Berlin for the boys and I. We had a great time and I even got a PB - so delighted. Recovering this week and itching to get out to run next week. 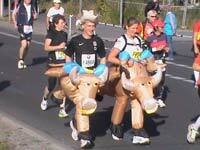 Looking forward to our Club's trip to the Torremolinos Half in 2014 with your company. Thanks again - lovely to meet you. Many thanks for the results link and the whole weekend in Berlin. It made it so much more straightforward to book with you and we all felt in our Gloucestershire 'team' that you looked after us very well and were great value for money, so many thanks to you, John and Gerry for your efforts on our behalf, much appreciated. 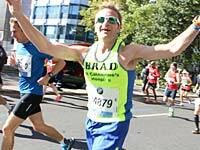 Thank-you very much for organising a fantastic weekend- I was extremely impressed at the lengths you went to in making the marathon weekend a very enjoyable experience. It would be very difficult to improve on your service. Paul and I have discussed doing it again next year!! The weekend gave us the opportunity to meet other runners with an interest in marathons and to hear all their stories. 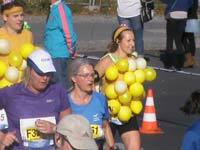 Just a note to say thank you for organizing a brilliant weekend in Berlin for the Marathon. I had a such a great time and met lots of lovely people. Hope to see you on another run. Just like to say thank you all. 'TEAM'..... The Welcome., Hotel., organisation., team spirit., goodbye...!!! You made the whole package friendly, helpful when needed...!! Thank You so much. Thank you for organising a great trip to Berlin, I had a great time on what was my first 'Running Crazy' adventure. In fact, I was wondering if you could give me some details on the Benidorm trip please? This time I'll be taking my husband Paul. I'm looking to run the half marathon and Paul is going to do the 10km. Many thanks. We had a great time in Berlin with 'Running Crazy' and would certainly recommend you to anyone wishing to take part in a running weekend. Hope to see you again soon.